Prime Minister Narendra Modi arrived in Leh on Sunday on a day-long visit to Jammu and Kashmir where he is slated to inaugurate developmental projects and officially kickstart the BJP's Lok Sabha poll campaign in the state. He started his visit by addressing a public meeting here wearing a Ladakhi gown and headgear. After greeting the audience in Ladakhi, Modi said: "Ladakh is the land of brave people. Whether it was 1947, 1962 or the Kargil conflict, the brave people of Ladakh have always defended the sovereignty and integrity of India". The Prime Minister also said that would inaugurate projects here whose foundation he had laid earlier. "The warmth of your reception has relieved the little cold I felt when I landed here today. I was humbled by the blessings of elderly mothers who came to receive me on my arrival despite the bitter cold. I promise to return your warmth with full interest through the development of this region," Modi added. 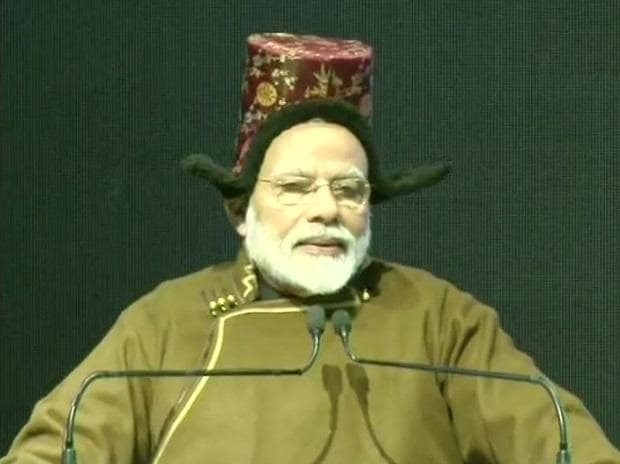 The Prime Minister said that over 300,000 tourists visited Leh during the last year and around a lakh also travelled to the Kargil district during that period. "Over 40 per cent of your population is compromised of students and your longstanding demand for setting up a university here is being fulfilled today." The Prime Minister is also slated to lay the foundation stones for developmental projects worth Rs 35,000 crore. He will later begin the Bharatiya Janata Party's Lpoll campaign in Jammu division by addressing a mega public rally in Vijaypur town, Samba district. Meanwhile, authorities suspended mobile internet services in Srinagar in view of his arrival.